Get a great deal on new home security & automation packages! 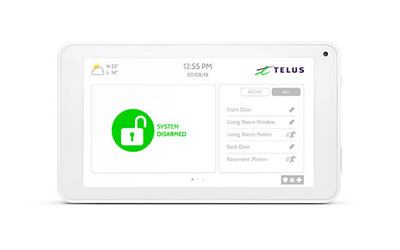 Acme Protective Systems is proud to now offer new home security & automation packages from TELUS SmartHome Security. These packages provide a fantastic security solution for you and your family at an affordable price. These packages offer the latest wireless security technology with the ability to remotely access and control your home on-the-go. They’re monitored 24/7 by our security professionals over the cellular [GSM] network for maximum reliability. Enjoy the satisfaction and peace of mind that comes from having a state-of-the-art home security system! See our packages below. Manage your home from anywhere. Control your security, lights and thermostat, see who’s at the door with live video, let friends and family in and more – all from your mobile phone using the dedicated app. Our expert home security team monitors your home 24/7 for fires, floods, carbon monoxide and break-ins. If an alarm is triggered our team takes immediate action and you’ll receive an alert through your mobile app. Stay safe with security cameras, sensors and wide assortment of devices. Manage everything from your smartphone and enjoy the peace of mind that comes with real-time monitoring, notifications and reminders. Make your home run more efficiently and safely. Enjoy energy savings during high usage months with devices like a smart thermostat. Plus, save up to 20% on home insurance1 with professional installation and 24/7 monitoring. Start by considering a package below that best suits your needs. You can always customize it with additional equipment when you contact us to order. Packages start at just $18/month3 – some conditions apply. Save up to $20 per month by bundling with TELUS’ home and mobility services. Great for singles and couples living on their own. Feel secure knowing what’s happening when you’re not around. Over $900 in home security, home monitoring and smart home devices are included with this package. Got pets, kids, or parents living with you? Know what’s happening in and out of the home to keep everybody safe and sound. Get at least $1000 in home security, home monitoring and smart home devices included with this package. Get the best home security today! You can purchase additional home security, home monitoring and smart home products to add to your package of choice. 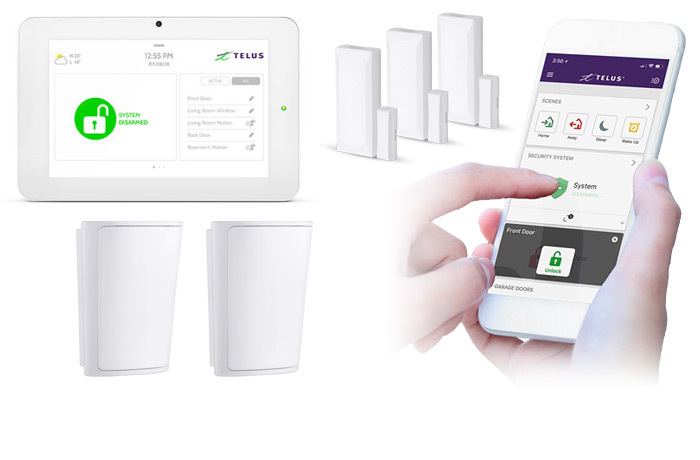 These high quality security and smart home devices work seamlessly with the TELUS SmartHome Security app. With professional installation and real-time home monitoring services, we’ve got you covered. Total control of your security system and all of your smart home devices. Control and interact with your home’s security system using this intuitive main control panel. Includes a built-in 5MP camera. Conveniently located control of your everyday smart home devices. Find enhanced flexibility and control through the wireless touchscreen. This convenient way to interact with your system can move with you around the house, allow you to check the alarm status, and more. Has a built-in camera. 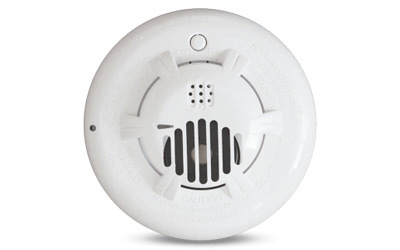 Get an alert as soon as smoke is detected in your home. 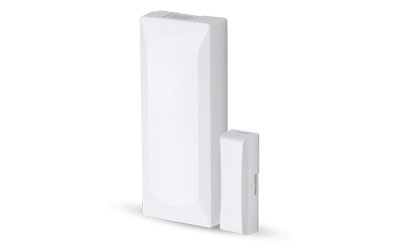 This wireless smoke sensor doesn’t replace your existing smoke sensor but rather provides additional awareness allowing for remote notification for smoke and heat detection through the app. Protect your home from unseen hazards. 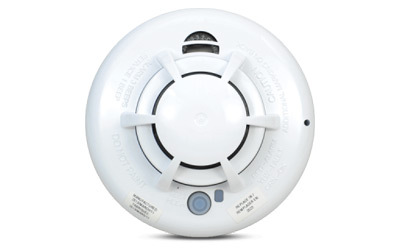 This carbon monoxide detector doesn’t replace your existing device but works alongside it to signal an alert to your control panel or app. Tamper protected device provides additional protection of your home. Detect activity around your home. 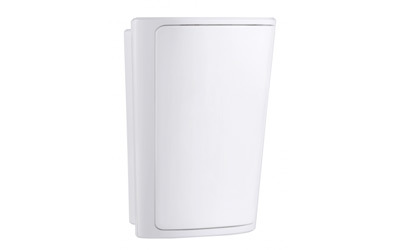 This motion sensor is an effective way to enhance your home security. 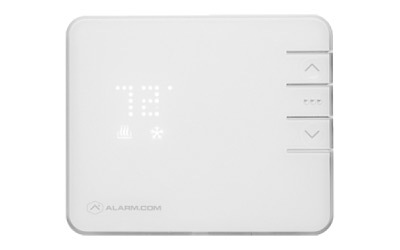 Combined with your alarm system, arm your house with this device to monitor movement and temperature. Pet immune up to 38kg (85lbs) and doubles as a temperature gauge. Be aware of which entrances and windows of your home are open and closed with immediate notifications through the app. Feel secure knowing critical zones are monitored. Monitor when glass has been shattered in your home. Even though you didn’t hear it happen, you can feel safe knowing you’ll be alerted. POPULAR! Be notified of emergencies that could result in property damage. Take action before it’s too late by installing the flood sensor. 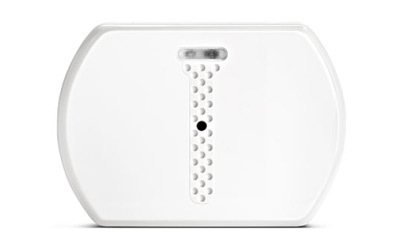 This home monitoring device will notify you of standing water so your home and family will be protected. 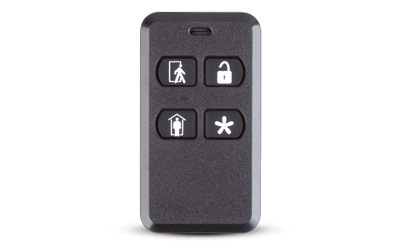 The keyfob remote is a compact, portable solution to easily arm and disarm your system when you’re close to home or already inside. Keep an eye on your kids or your pets when you’re away from home. Watch more areas of your home with indoor cameras. 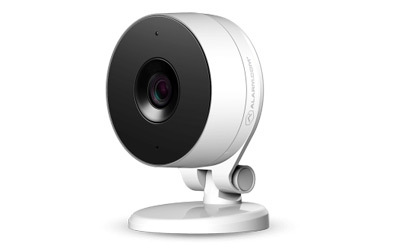 This camera is WiFi-enabled, has 1080p HD resolution and IR night vision, is two-way voice capable, and supports motion activated notifications and recording. POPULAR! See what’s happening around your home. This weatherproof camera can capture live and recorded video around your home. Breathe easy when your house is under reliable surveillance, even in the dark. This camera is WiFi-enabled, has 1080p HD resolution and IR night vision, and supports motion activated notifications and recording. Hear it ring, see who’s there and have a two-way conversation, no matter where you are. 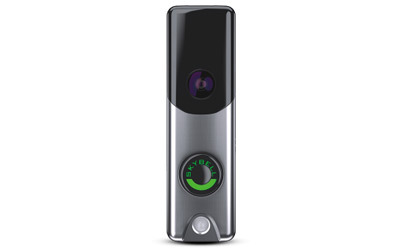 Remotely look to see guests at the door with a doorbell camera. Use the app for live and recorded footage and even hear and speak to visitors. This weatherproof camera is WiFi-enabled, has 1080p HD resolution and IR night vision, is two-way voice capable, and supports motion activated notifications and recording. POPULAR! 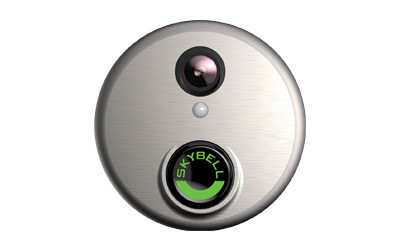 Use the doorbell camera to see who’s at the door when you’re not at home or can’t come to the door. The app will provide live and recorded footage so you can see, hear and speak with who’s at the door. 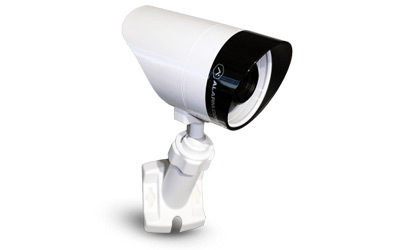 This weatherproof camera is WiFi-enabled, has 720p HD resolution and IR night vision, is two-way voice capable, and supports motion activated notifications and recording. POPULAR! Come home to the perfect temperature. The smart home thermostat can be set to automatically adjust to your household’s needs throughout the day. You can also adjust your home’s temperature on the go, saving you energy and money. POPULAR! Let friends and family into your home while you’re away. Expecting someone? 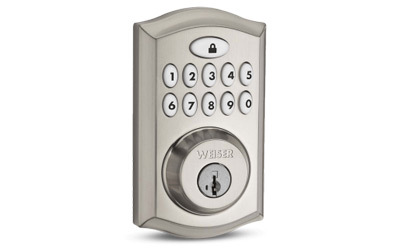 Lock and unlock your door remotely or create a special code for your smart door lock that will only work during the times you specify – great for visitors, deliveries and appointments. Has illuminated buttons and weather- and vandal-proof construction. Close your doors from anywhere and feel reassured. 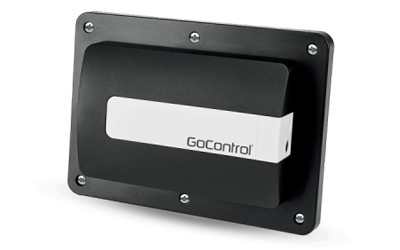 The garage door opener is perfect for easy remote control through an app. It also allows for control panels to open and close the garage as well. Turn on your lights without flicking a switch. 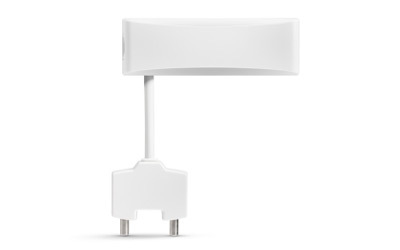 Connect the smart plug to any lamp in your home for full control. Set a schedule for controlled lighting that brightens and dims as you see fit, creating just the right atmosphere for your home. Get dinner started on the way home. The smart plug gives you control over any appliance it’s connected to in the house. Use the control panel or app to start the coffee machine before you head to the kitchen and begin your day on the right foot. Fully automated energy efficient lighting, remote controllable via app. 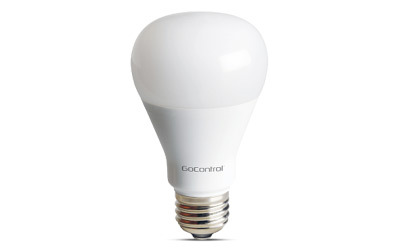 These dimmable LED light bulbs offer energy savings with 60W of light while drawing only 9W of power. Home insurance providers typically offer discounts when security systems are installed. Discounts range from 5 – 20%. Please check with your home insurance provider. With a smart thermostat installed, expect to save up to 6% on your heating bill. Savings will be greater if you also have light and energy management systems in place. TELUS SmartHome Security bundle offers a better price and more bundling options including the fastest home internet technology, the best TV experience, and the largest and fastest mobile network. $18/month for the Secure plan available to TELUS Consumer mobility post-paid customers who are also subscribed to at least one TELUS Consumer residential service, and who have not subscribed to TELUS SmartHome Security services in the past 90 days. Only Consumer mobility and home services eligible for bundle discount. Offers subject to change without notice. Cannot be combined with other TELUS SmartHome Security promotional offers. Minimum system requirements apply. Final eligibility for the services will be determined by a licensed and certified TELUS technician. Bundling discount of $20/month applies to regular price of Secure, Protect and Control plans for 36 months. Full regular price applies – currently $38/month (Secure), $48/month (Protect), and $53/month (Control) – after 36 months. Regular price is subject to change without notice. A cancellation fee applies for early termination of the 3-year service agreement. The cancellation fee is $10 per month for Secure, Protect and Control plans, multiplied by the number of months remaining in the service agreement. Available to customers signing up for TELUS SmartHome Security on a 3 year service agreement. All recurring monthly charges will be waived for any service cancelled in the 30 days following installation, promotional and installation credits will be reversed, and all equipment rental monthly fees will not apply; however, the rental equipment must still be returned to TELUS or a charge will apply. Rental equipment must be returned in good condition upon cancellation of service, otherwise the replacement cost will be charged to the account. 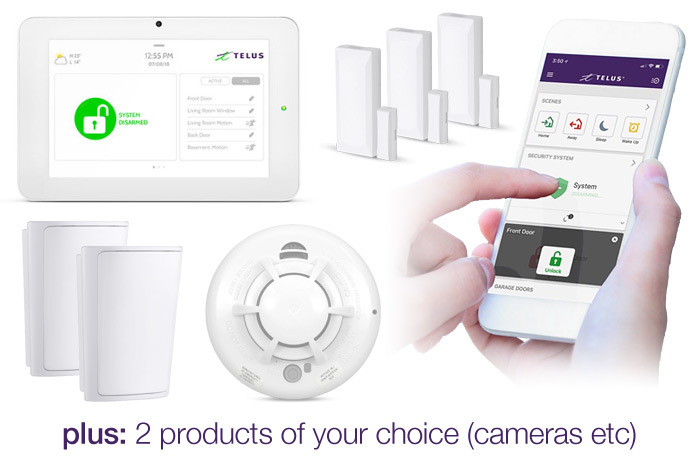 Customers who sign a three year contract for a TELUS SmartHome Security Control package receive one smoke sensor valued at $60, three door/window sensors valued at $20 each, two motion sensors valued at $60 each, one Qolsys control panel valued at $495, as well as a choice of two video or automation devices including a doorbell camera valued at $160 and outdoor camera valued at $220. 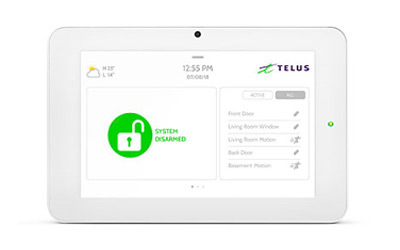 Included equipment is provided to TELUS SmartHome Security customers as part of the recurring monthly rental fee. Rental equipment must be returned in good condition upon cancellation of service, otherwise the replacement cost will be charged to the account.